Welcome to the introductory issue of Inspired Writer! We’re looking forward to bringing you teacher tips and tricks in the weeks to come — this month, we are keeping it brief since we’ve been so busy creating our Core-Standard compliant curriculum! We completed this undertaking thanks to the talented classroom teachers who serve as our curriculum creators. I am enormously grateful for their expertise and hard work. Arlynn, I’m truly grateful to have you as part of our team. 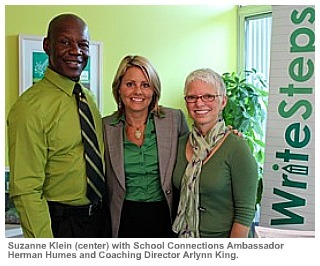 aspect of this work, especially your coaching services for teachers. thanks you for your dedication. 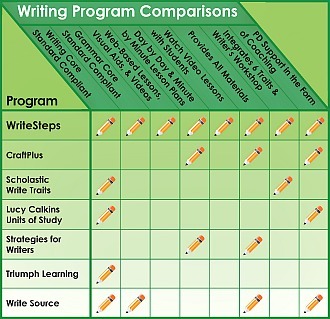 Since we introduced WriteSteps to elementary schools four years ago, we’ve witnessed amazing growth in student writers, teachers, and test scores. This month, we reached another milestone when we unveiled a new and improved WriteSteps. The biggest news is our complete alignment with the Common Core Standards. We’re still keeping them creative, but now we’re also thoroughly teaching each of the Writing and Grammar Core Standards. The curriculum overhaul, which last year won a “Best of Entrepreneurs” award recognizing its innovative qualities, stands out because it delivers complete lesson modules that meet the Core Standards while also utilizing technology in ways that haven’t been seen before. What we’ve created is the first of its kind — an online, clickable daily lesson calendar with downloadable lesson plans, visual aids, and videos demonstrating the lessons. “It has been a gift and a blessing to work with so many gifted teachers on such a successful project, really a dream-come-true,” Suzanne says.